David Brin’s Uplift novels are among the most thrilling and extraordinary science fiction ever written. 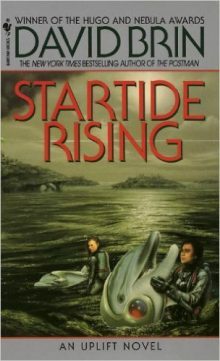 Sundiver, Startide Rising, and The Uplift War–a New York Times bestseller–together make up one of the most beloved sagas of all time. Brin’s tales are set in a future universe in which no species can reach sentience without being “uplifted” by a patron race. But the greatest mystery of all remains unsolved: who uplifted humankind?